Social networks are networks composed of nodes (people) and links (relationships). Thanks to the Internet, there are many social network platforms to let people grow their social networks online. Social network platforms have been part of our lives now. We login Facebook, Twitter, Instagram, and many others to get connected with everyone else in the world. As said by the Small World theory, every man in this world is connected to each other no more than a 6-degree relationship, meaning that a stranger in a different country may be a friend of your friend’s friend’s friend’s friend. 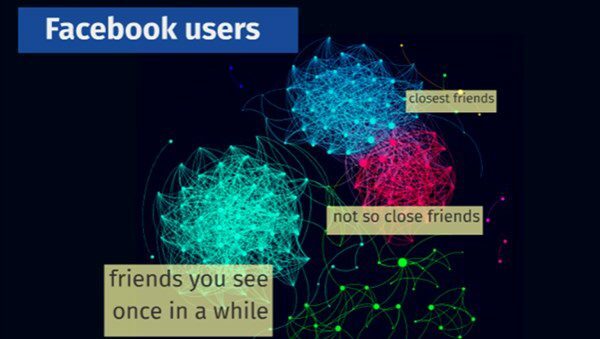 If you try to plot all your Facebook friends, you may get a network like the figure below. But if we plot the location of our friends on a map, we can find that most of them are actually closer in space than we think, as shown in the figure above. Everything happens in this world takes a place. Therefore, location-based information can help to discover patterns and even causes. For example, if we can plot every mention of Ebola on Twitter, we will be able to see how it diffuses across space and time. We should always bear in mind that geography does matter, and Supergeo is here to help to discover the power of geography. Supergeo provides affordable GIS solutions on Desktop, Server, and Mobile platforms, and there are now more and more happy users all around the world. Join them today and gear up with the best GIS suit and tie provided by Supergeo.